South London has many homes with shutters and shutters in Wandsworth have become exceptionally popular. Many traditional terraced and semi detached homes in Wandsworth have seen a rise in popularity of opening up the rear area of the property to create an open plan living area. Open plan living is great and with space in Wandsworth and other London suburbs at a premium, many people choose to use lots of glass in their open plan living areas, to create a feeling of increased space. However, being Wandsworth (and infact typically of many areas of London) you are never that far away from a neighbour who can see directly into your living space. Shutters on French Doors in this Wandsworth home were the perfect solution to retain the feeling of space and light, while gaining privacy at night. 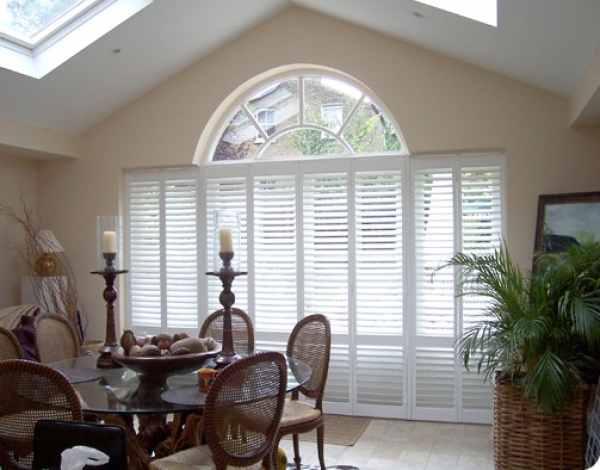 This Shutterly Fabulous shutters customer was quite overlooked by neighbouring Wandsworth homes and as the family ate daily in this dining area, they wanted the ability to gain privacy. Shutters proved a great solution. The dining room French doors have our French door shutters installed which can be folded back when required or close the shutters panels and just tilt the shutters slats. This brought great flexibility to this Wandsworth based customer. The French door shutters show left the arch clear at the top as the customer in Wandsworth wanted to leave this feature window clear. The shutters are finished in white and made from premium grade poplar hard wood. The shutters have been designed to match the window framing and have Open Sky concealed push rods.